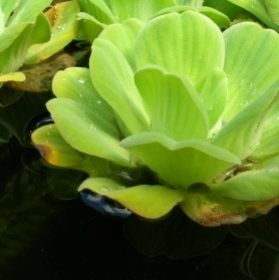 As well as being a feature of the Tropical House pool, our stocks of Pistia stratiotes (commonly named water lettuce) are used by teachers, children and volunteers, where it provides a good example of plants’ abilities to adapt their structures to very different habitats. P. stratiotes is a floating water plant grown for its decorative foliage and particularly suited to indoor pools and aquaria, although it has to be managed carefully: if left to grow unrestricted its roots form ‘mats’ which prevent oxygenation of water and kill anything living in the water. It is a deciduous perennial plant, but will retain its leaves if kept at constant temperatures of 19-21C (66-70F). It is now found throughout tropical regions, often as an invasive weed! It was first recorded in Africa’s Nile region in the nineteenth century.